Not far away from my house, may be 500 meters, there is one of the four special perfume shops in my town. It could be a luck but it's also a spell, often I have to put myself together not to visit it everyday. The shop is owned by an old couple, both adorable. It took me long to check the shop, from outside it doesn't look very inviting, in fact it still looks cold and unfriendly. When you enter it you don't find the usual professional smiles. I had to get over the indifference, most of all of the old gentleman. But now we are such good friends, we have long talks about perfumes, about his business, sadly in my very poor local language. They used to have a drugstore and 15 years ago they opened this perfume shop. And they are happy with it, happy with the clients against all odds (50 meters away there is one of a massmarket perfume counters). So I'm happy, too, go and check Annick Goutal or some Caron or Etro or Creed or Maitre Parfumeur et Gantier, and mostly my old Guerlains. Or simply to try once again Joy in Perfume concentration, I'm still not sure if I like it or not (I own a vintage Eau de Joy which is less strong in flowers, more cologne). And quite often I end up buying something, even if it's the perfume extrait of a perfume that I already have in eau de toilette or eau de parfum. The old gentlemen never quits in trying to convince me about perfumes of Floris and Penhaligon's. He seems convinced that English perfumerie is the best. And if it was English perfumerie then should be a Lilly of Valley smell. Last time it was Penhaligon's Lilly of Valley and I smiled with pleasure. Yes, I like the smell, but I will never tell me him that I find all Lilly of Valley perfumes a bit flat (except probably Diorissimo, which takes the Lilly of The Valley out of the garden). And there is also something disturbing for me in the smell, something which keeps me away. It could be nice sometimes, and for example I thought seriously for a while to purchase Fleurissimo by Creed). Anyway, I left the shop with the Penhaligon's Lilly of the Valley on a strip, smelling it time to time. And suddenly, in the middle of the street, I was stuck, I saw the floating image of Madame Bovary. The smell reminded me of her tragic face. 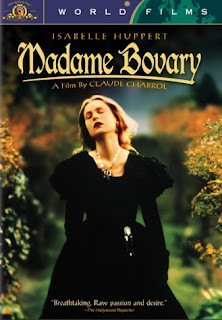 I didn't read Madame Bovary since I was a teenager and for good reasons, it's a stunning ravishing sad book. And, most of all, we all have to recognize at some point the Madame Bovary in ourselves. Mine comes out sometimes. But I don't want to be Madame Bovary, I try to keep it low and hidden. Lilly of the Valley is the Madame Bovary smell. Lilly of the Valley is delicate flowers and fields through the windows, feminine and apparently quiet and it never laughs with all mouth. Even the smiles are sad and tragic. And up to it is the keen, the impatience, the smoky background of a lily of the valley still painting. The unassumed desire. Lilly of The Valley is not for the sincere Anna Karenina, or for the reflective Lady Chatterley or for the ingénue and intelligent Lady of the Camellias. Nevertheless, I will still play sometimes with the Lilly of the Valley smells, as much as I will always suffer of a slight bovarism syndrome. Sometimes I, too, don't want let the moment pass.